DETEXI Client Archive Tool pulls recorded video from the NVR archive transferring all frames in the time segment selected into local memory. For this reason, the amount of video that can be viewed at once is limited, and the initial load time is very affected by the network the video is being pulled across. Once loaded, however, this video can be viewed very quickly and efficiently at very high frame rates. When users already know the time and date of interest and only need to review a small amount of video, they might find the Client Archive Tool more efficient. The ARCHIVE button on the Client Start Page launches the Archive Tool built into the Client. 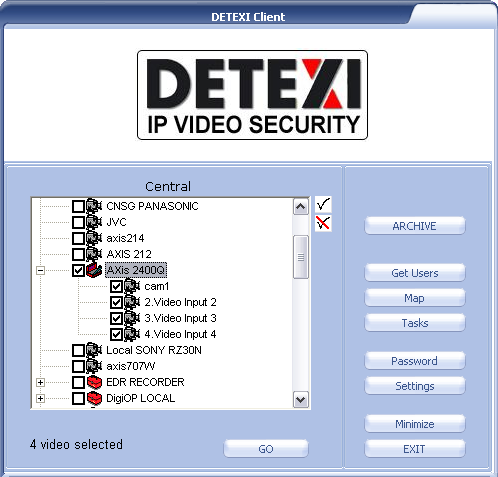 DETEXI Archive Viewer included automatically with the DETEXI NVR and Remote DETEXI Client installation connects local and/or remote users to the DETEXI NVR recorded video (NVR archive) for video viewing, retrieval and export. For remote users permission/authentication is required. When large amount of video need to be scanned for events the Archive Viewer is the tool of choice. Rather than loading a collection of video into local memory, the Archive Viewer streams video directly from the NVR archive over the network. For this reason, a full 24 hours of data is at the user’s fingertips for viewing at all times without requiring a large initial load time. However, this limits user to slower possible playback speed — completely dependent upon the network connection between the Archive Viewer and NVR archive. It is not uncommon to see pauses in video playback for buffering of the video stream. When located on the NVR computer, the Archive Viewer is very efficient — limited only by the read speed of the hard drive and decoding speed of the video card.